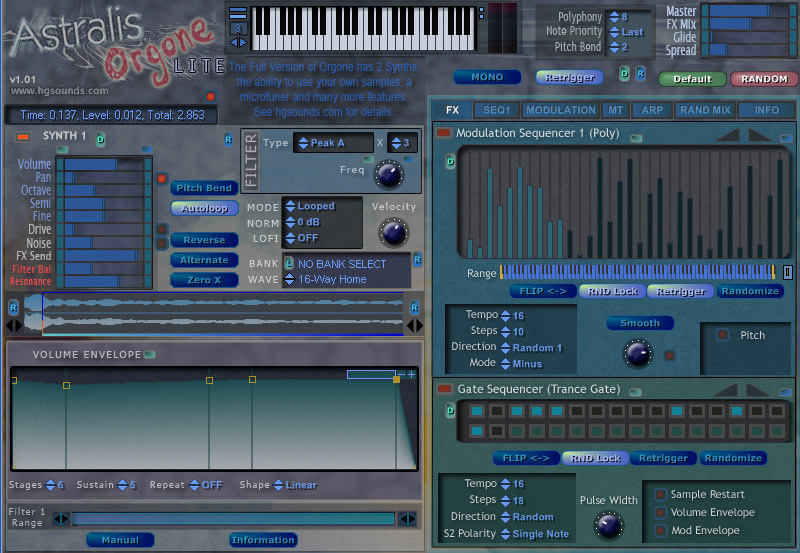 Astralis Orgone / Astralis Orgone Lite by Homegrown Sounds is a Virtual Instrument Audio Plugin. It functions as a VST Plugin. Astralis Orgone is a "Dual Sample" based Synthesizer. It is the next generation of the Astralis Range and is highly optimized with great improvements in CPU use and especially load times. It is a rounded synth capable of sounds ranging from Trance Style Rhythms to Hard Leads and excels at Pads, Atmospheres and FX. Great care has been taken into developing a logical layout and many useful control features, such as double click resets and CTRL fine control adjustments. It comes with 128 presets and 150 samples, though you can add your own samples very easily. Astralis Orgone Lite is the free version of Astralis Orgone with a reduced feature set. 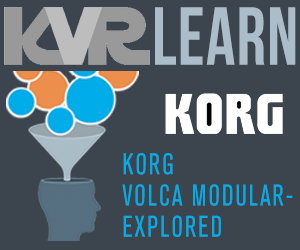 It is free, fully functional and a feature packed synth in its own right. It includes 128 presets and the diversity of sound created from 25 samples demonstrates the power of the Astralis System. Great for creating atmospheric Pads/Ambience/FX as well as Trancegate, Modulated and Arpeggiated Rhythms. The synth is free to use but donations are always appreciated to support future developments. More details here. A Sampler which uses 16/24/32bit WAVS. Filter with Low Pass, Hi Pass, Notch, Band Pass, Peak A and Peak B modes cascadable up to 8 times. Volume, Pan, Octave, Semi and Fine Tune controls. 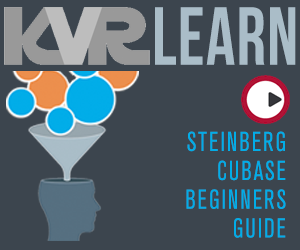 GUI Volume Envelope with up to 32 stages and repeating range. Zone - Limit to a range of the keyboard. GUI Wave Display and Overlay for visually editing Loop Points and Start Position. 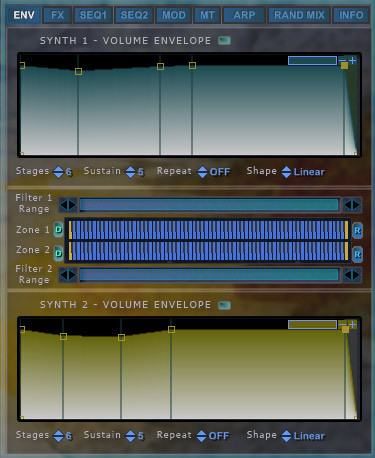 Unique Bank System for handling samples - Emulates a hardware Synth with Bank dropdown menu and a dropdown to select the sample from this bank. banks are simply folders of WAVs in the user selectable sample store location. Creating a bank is simply a case of creating a folder and putting some samples inside. Rescans the hard drive to find newly added files without restarting the Synth. 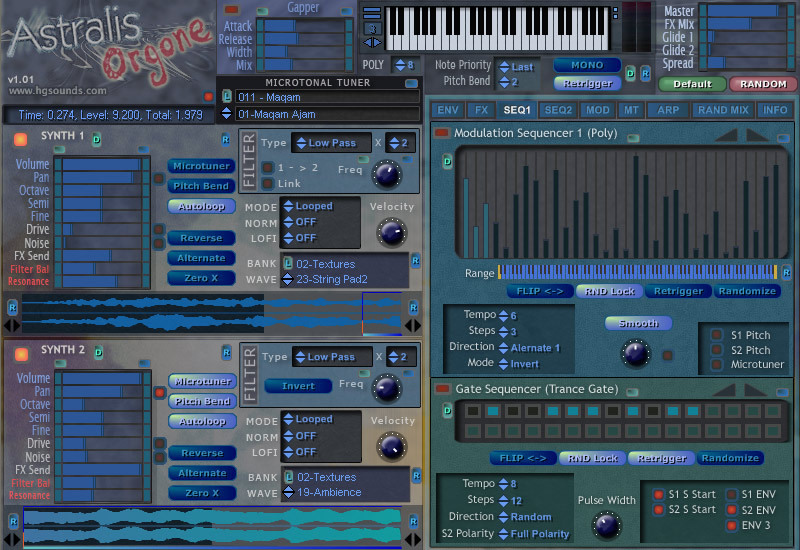 32 Note Sequencer with GUI buttons. 4 Modes - Forward, Reverse, Random and Alternate. Polarity mode for Synth 2's gate can play All Off Notes, or First Off Note following an On Note. 12 Possible Sources that can be mapped to 5 destinations from a choice of 31. 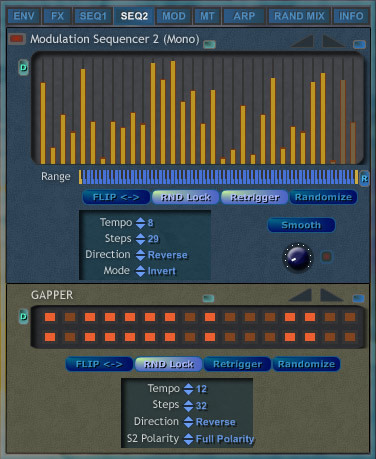 Up to 32 Step sequencer to control the Gapper Pattern. Shift pattern left or Right. 17 waveforms used through the Modulation Matrix. 17 Different Modes (more to come). 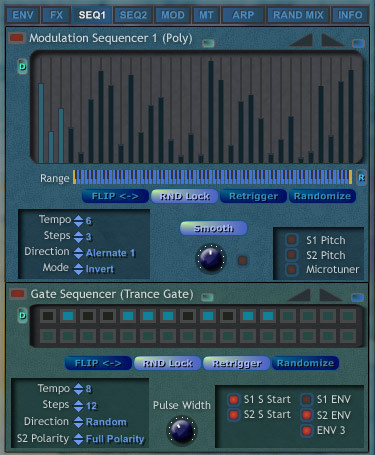 Note Sequencer Mode with up to 32 steps. Note Enabler for skipping steps in any ARP Mode. Range - Limit to a section of the Keyboard. Parallel Routing Mode and all possible combinations of chained effects (127 modes). 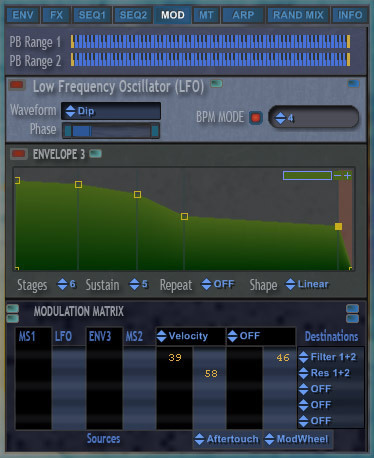 LFO based Filter with Low Pass, Hi Pass, Notch, Band Pass, Peak A and Peak B modes. Organic - Unique Delay Based effect. Can be used via the Modulation Matrix. Has direct Pitch sends to each synth with many modes plus ability to send through the current Microtuner Patch. Keyboard Range - can be limited to a section of the Keyboard. 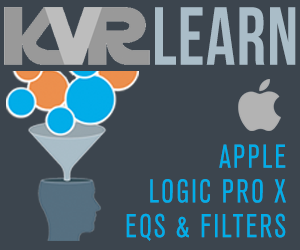 Smooth Mode for creating legato or using as a virtual LFO. Secondary Raw Output via the Modulation Matrix. GUI Slider Bars lockable to notes depending on selected mode. As above but mono and without the Pitch Sends. Used via the Modulation Matrix. Automatic Stereo randomization, switchable per Synth. 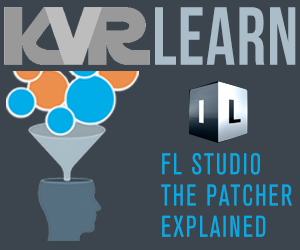 Can use Sticky Keys for easy hands free editing of patches. Can behave as a normal Keyboard. Animates all incoming MIDI data. Scroll Mode can be switched off in which case mouse left/right operates pitch bend, up/down the Mod Wheel. MIDI Retrigger - Retriggers any incoming MIDI notes. A single Random Button is used to randomize all sections selected in the Randomization mixer. FX has its own Randomize Button, will randomize only the selected Effects. Randomization has been carefully limited to the most useful setting to ensure more chance of a usable patch. Every control has its own min/max set to ensure a useful outcome. Additionally Local Randomizers are everywhere throughout the synth for each section. Uses the same bank/patch system as the Sample System, folders can simply be added to the user selected MT Patch location. Up to 127 Note Scales supported. Does not use MIDI to retune like many other systems which means that Pitch Bend can be used with MT patches. 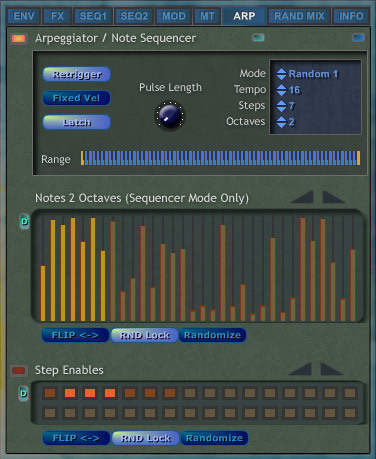 Octave Stretch for Acoustic Instrument Simulation. 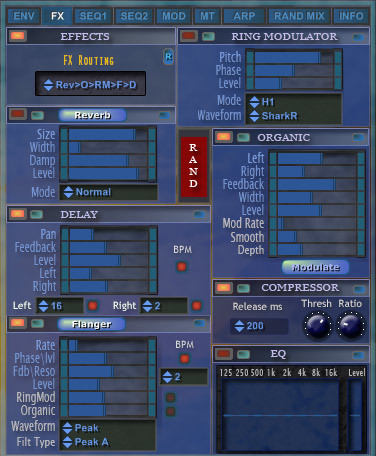 Has 4 Note Layout Modes to provide flexibility on how patches are used. Unused notes switchable between last note or Octave note. Switchable per Synth so for example Pythagorean tuning can be overlaid on the Equal Temperament for a harmonically interesting sound. Most controls have an in built default setting, generally double clicking will reset to this value. Also each section has a Default Button. There is a Master Default Button which will set Most setting to the default patch. as a simple starting point. All controls display their current value when manually tweaked, usually in percentages.